So now it has ended — three for three. No, I’m not talking about the World Cup soccer championship that you unfortunately can’t seem to get away from, even on serious news reports. I’m referring to this summer’s chamber music concerts by the Bach Dancing and Dynamite Society. 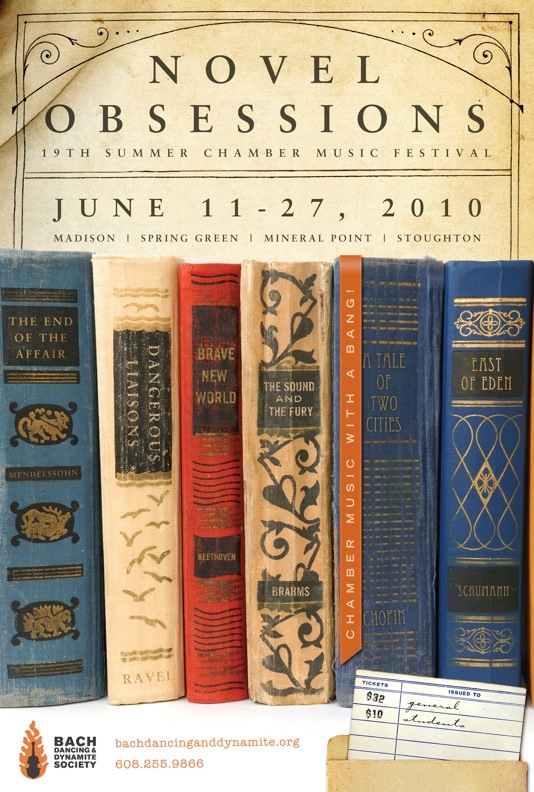 The BDDS is ambitious: It did six different novel-related themes (see the poster below) in 12 concerts at four different venues over the past three weekends in June. I couldn’t make it to all or even most of them. But I did get to hear three different programs in three different performances at two venues. And I can say I’m three for three because each time, the BDDS concert proved a winner – offering a superbly planned and well executed event that should leave no doubt in anyone’s mind about the artistic merits and audience pleasures offered by the BDDS. BDDS is, in a word, first-rate. The premise was that “Eden” was the traditional harmonic and melodic language of Western classical music seemed a stretch, as even BDDS staff admitted, and didn’t really relate to John Steinbeck’s famous novel-turned-movie. So maybe the Eden metaphor wasn’t such a stretch after all. Whatever the tie-in’s success, the music certainly worked. It was a great wrapping up of a season, one of the best in years, that will remain unforgettable for me. The guest artists all proved terrific. 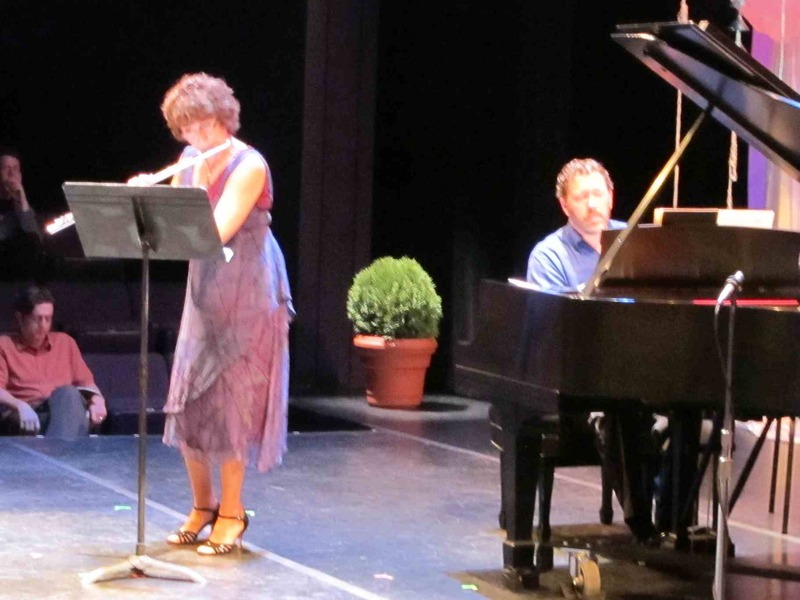 Besides the BDDS co-directors flutist Stephanie Jutt and pianist Jeffrey Sykes, there were cellist Parry Karp and violinist Suzanne Beia, both from the UW Pro Arte Quartet. All are familiar and acclaimed. But there were others. And where does BDDS find such talent? 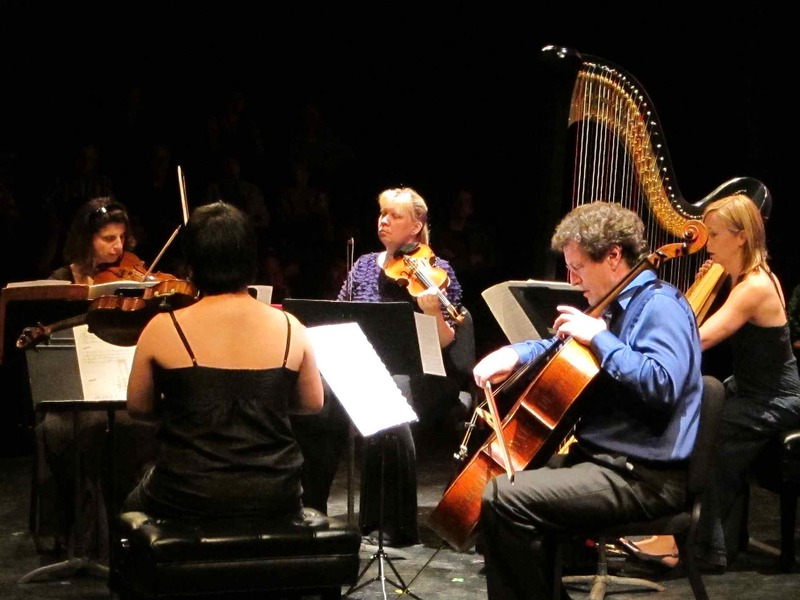 The imported artists included Heidi Krutzen, an absolutely first-rate harpist from Canada, plus violinist Carmit Zori and violist Yura Lee, both based in New York and both stand-outs for their rich tone and animated, exacting and precise playing. Still, the focus was on the repertoire, which I would rank in three tiers. 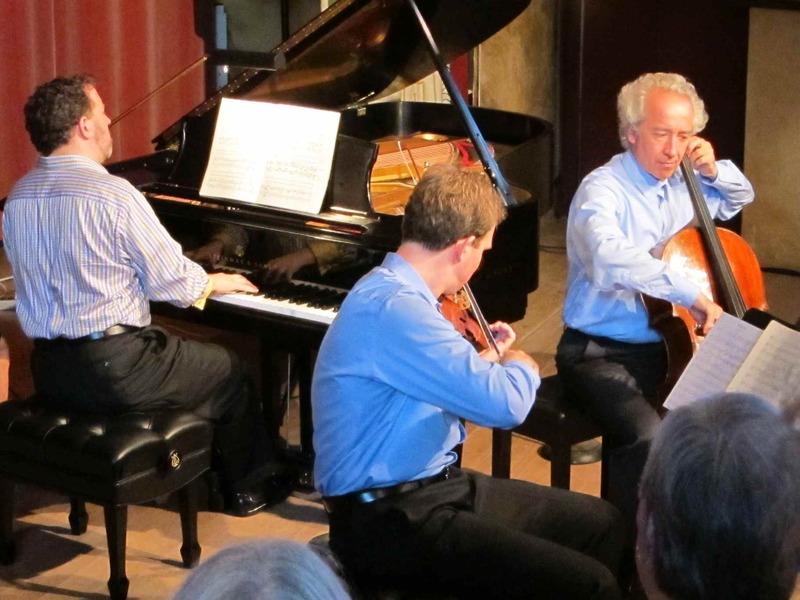 At the top was the concluding piece, Robert Schumann fabulous and famous Piano Quintet (below), used both to close both the series and to mark the composer’s 200th birthday. It was given a precise, balanced and edgy performance with both great lyricism and great dynamism. I particularly liked the clarity of Sykes’ piano part, which didn’t get drowned in pedal or drown out the others in volume. You simply won’t hear a better performance. In the second tier was the opening piece, a charming and tuneful Canzonetta for flute and piano by Samuel Barber, whose centennial is this year. This arrangement of the slow movement from Barber’s well-known Piano Concerto worked beautifully as a miniature. Also in the second tier was French composer Albert Roussel’s early 20th-century Serenade for flute, harp, violin, viola and cello (below top), which proved especially alluring and beautiful in its slow movement and which showed Poulenc-like charm in its fast movements; and contemporary Canadian composer R. Murray Schafer’s “Theseus,” for harp and string quartet (below bottom), which seemed uneven to me at times, but at its best it was compelling music based on a Greek myth. 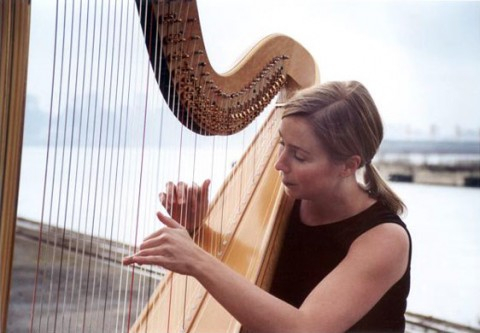 On the lowest tier was contemporary New Zealand composer Garreth Farr’s “Taheke” (Maori for waterfall) for flute and harp (below). It was a thoroughly pleasant piece, though hardly deep, with the flute carrying the melody and the harp picking out arpeggiated figurations, all to recreate a sense of watery impressionism. Good summer fare. 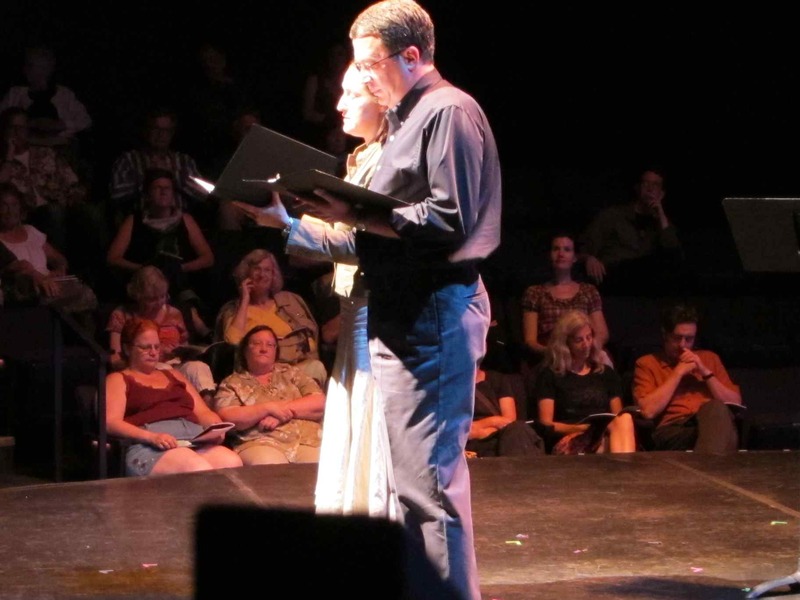 Also included was a reading from John Steinbeck’s novel “East of Eden” by two members of Forward Theater, Sarah Marty and Jim Buske (below). They chose passages about human creativity as a species marker and about the need of the individual to create for the group to interpret the group, which does not create. 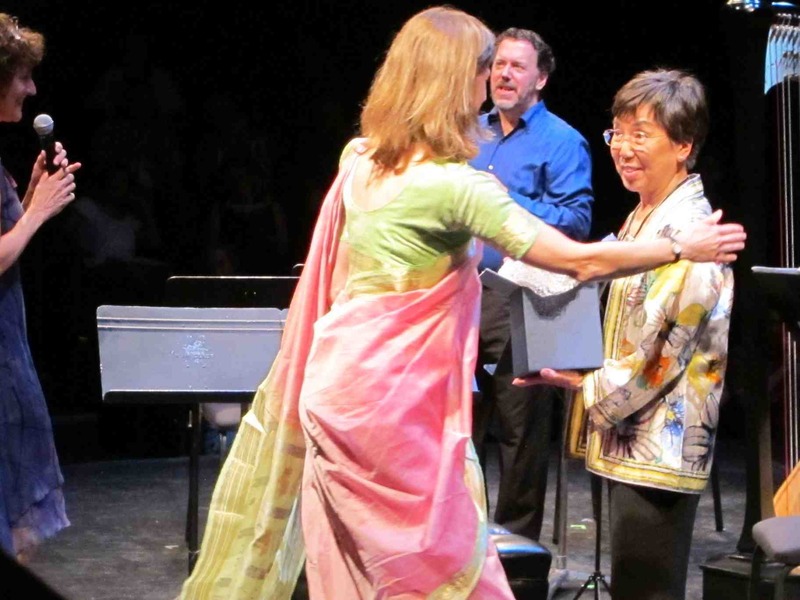 The concert also recognized volunteer Anne Stoelting (below right)with the Big Bang Award and recognized executive director Samantha Crownover (below, in the lovely sari). Clearly, it takes a village to entertain a city. So I got to hear classic works and new music, all played by top-flight instrumentalists. In addition I got to hear some spoken words – and that is a great combination I hope BDDS will incorporate every year, through either prose or poetry. 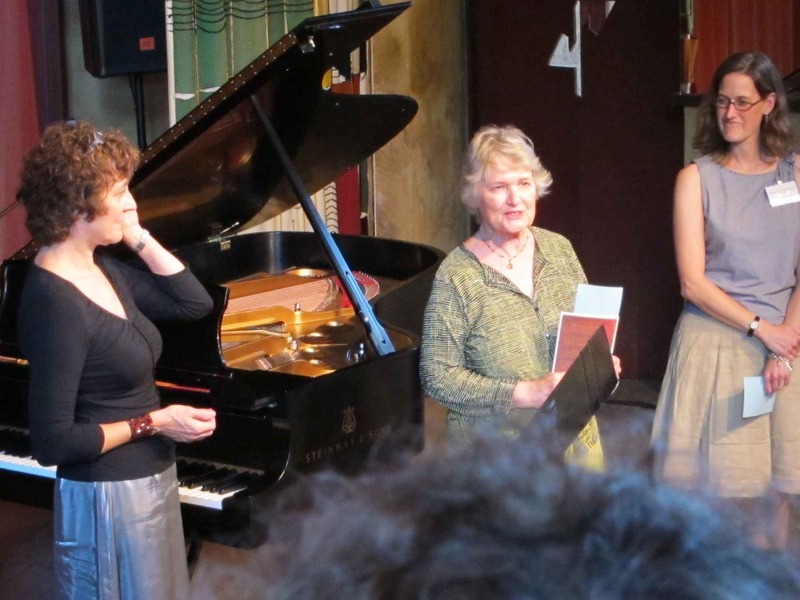 (How about using published poems or commissioning some local poets and writers to write occasion-specific or works about music to be read aloud at next summer’s concerts?) Words and music are such a natural pairing, and seem to go together as much as books and CDs do. Anyway, at the end the audience applauded wildly and gave a standing ovation while the performers took several well deserved bows were taken — for the concert, for the whole series and, I suspect, for the whole philosophy behind the Bach Dancing and Dynamite Society ‘s to make great chamber music, old and new, accessible and enjoyable. BDDS’ trademark informal approach to serious art couldn’t have worked better. So, bravo to all for many weeks of instructive pleasure. Did you go to any BDDS concerts? What did you think of this season compared to others? Do you have a message to leave the BDDS folks? How do you think they should celebrate their 20th anniversary next summer? Classical music interview: Teenage pianist Joseph Hauer discusses his life, the music of Beethoven he will perform at the first free Concert on the Square this Wednesday. Part 2 of 2. This Wednesday night, June 30, at 7 p.m., the Wisconsin Chamber Orchestra, under the baton of music director Andrew Sewell, will kick off its 27th annual series of Concerts on the Square up around the state Capitol. But the opening concert this week will feature classical works. And the featured soloist is a student – Joseph Hauer, an Appleton, Wis., resident who won the Wisconsin Chamber Orchestra’s Young Artists Concerto Competition. He will perform the first movement of Beethoven’s Piano Concerto No. 3 in C Minor, Op. 37 (1803), the same piece Hauer (below) played to win to the competition. Other works on the “Summer Romance” programs includes Mozart’s Overture to “The Marriage of Figaro,” Wolf-Ferarri’s Overture to “Il segreto di Susannah,” Edward MacDowell’s “To a Wild Rose,” Rachmaninoff’s “Vocalise,” two Slavonic Dances by Dvorak and two “new” tangos by Astor Piazzolla as well as the love theme from “Cinema Paradiso” by Morricone. What other academic fields of study or classes do you like and do well in, or dislike? I was home-schooled. I dislike school in general. This year, I had to take a course in Apologetics — the reasonable defense of the Catholic religion and its doctrines. I may not have enjoyed the “doing” of the class, but I liked it because it was extremely useful and necessary to me. I learned a lot from it and I plan to continue studying it. Do you have other extracurricular activities or hobbies? I have a few hobbies. I love snowboarding, but I take a lot of flack for it since the risk of injuring limbs doesn’t go very well with a career in music. I water-ski in summer, and my goal for this year is to learn how to ski slalom. I disc golf at least once a week in summer. Our family has a golden retriever, but the general consensus is that she’s my dog. I trained her from when she was 8 weeks old. I’ve taught her all the basics — sit, down, stay, come, and heel. She can do all those by voice command or hand motion. I also taught her to freeze on command, cross her paws (as if praying), roll over, play dead, and shake hands. What is the hardest part of playing the piano well? Piano is a percussive instrument: the hammer hits the string and makes a sound. The hardest part of piano is getting rid of its percussive quality and creating illusions — making it sound like a voice, a bowed string instrument, a brass instrument, or any other beautiful non-percussive sound. It is very easy to get caught up in the technique of “pushing the right buttons in the right way” on the piano. Anyone can push a button and no audience wants to hear a performer hit buttons, even if he hits a lot of buttons very accurately. Just making beautiful sounds still isn’t enough — only a few people are satisfied with that. Most people want to be affected by the music, they want to feel something from it. The key to doing this is simply to be human; that is, to listen to the sounds that the piano is making and react to them. Only a person can react in the moment to what is happening on stage right then. Performing is a complete experience — the energy of the audience, who is in the audience, and how I am feeling on that particular day all contribute to how I perform. Are there concert pianists you especially admire or like to listen to? I haven’t listened to as many recording as most people because I am afraid of becoming a “copier.” I’d rather figure out for myself how I feel a piece goes by what is written in the score than construct a performance by “cut and paste” from recordings I’ve heard. I do have a few performers I admire: Evgeny Kissen, Yefim Bronfman, Ilya Itin and my studio-mate at Lawrence University, Michael Smith. I’ve actually listened to more violin music than piano music. I like Maxim Vengerov, Vadim Repin, Jascha Heifetz and Itzhak Perlman. I’ve noticed a trend in my listening habits. My favorite professional performers are all Russian, whether on violin or piano. Do you have favorite composers and pieces, or less favorite composers or periods of music? “Favorite” is always hard to answer. I usually like best what I am playing at the moment. 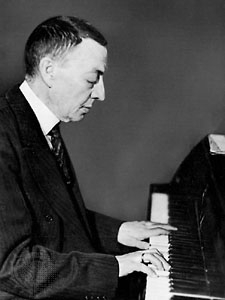 I would have to say, though, that my favorite composer is Sergei Rachmaninoff (below). And my favorite piece is Rachmaninoff’s Third Piano Concerto. I like music from the Romantic period the best – Tchaikovsky, Chopin et al. I enjoy Classical music but less than Romantic. Baroque music is very good to play, but I don’t enjoy performing it that much. It is very intellectual. I like to have music that focuses on feelings, music that speaks directly to the audience. I don’t like 20th-century music and beyond. It is rather obscure, I don’t relate to it. I appreciate some Shostakovich and Prokofiev, but very seldom for the melodies. I like a few pieces by Debussy. To sum it up, I could say that I don’t like anything that another musician would consider “genuine 20th century.” If the music is stylistically romantic, I like it. What would you like the audience to know about Beethoven’s Third Concerto and especially the first movement? I ‘d much rather not have the audience know anything about the piece. However, it helps to have heard the piece before if one is going to relate to it more easily. I’m sure most people have heard it, so I’m not worried about that. If I tell the audience what I practice at home, or if they have an idea of how the piece “should” go, they’ll listen for what they want to hear or are “supposed” to hear, rather than just enjoy the music. The critics can listen for what they want to hear, but I play the piano because I want the audience to ENJOY the music, not judge whether I followed the “directions” or not. I had a lot of trouble relating to this piece, since it is relatively early Beethoven – VERY classical and not very romantic. My teacher told me to come up with a story to go along with the music. However, music conveys emotions, not ideas or stories. So even if I do have story I’m thinking about, I don’t want the audience to know about it. I just want the audience to hear and feel the emotions that the story helps me call up. So, I will not tell you what the story is. I rarely think of a story, I just listen and play; this was an exception. What does it feel like to play a concerto with an orchestra when so often piano play solo? Playing with an orchestra is the best thing possible for a musician. When I play with an orchestra, I have the best of both worlds: I get to play with all the wonderful orchestra musicians (as if I were a violinist and a part of the orchestra), yet I am still the “soloist” and get to play the piano. It’s a collaboration. When the musicians and the conductor are all on the same page, the power of that bond is terrific. No solo recital can match it. I find it MUCH easier to play with an orchestra because I have so much more to listen and react to. For a solo, I have to come up with everything on my own. With an orchestra, we’re all listening to each other, reacting to each other, and combining all our feelings into a single performance. It’s like when a hundred people all say the same thing in a normal tone of voice: it may not be loud but the power it carries is almost frightening. Do you have advice for other teenagers or young people who are serious piano students or music students? Love what you do. If you want to go into music, do it because you love it and don’t want to quit. Otherwise, it will be just another job that brings in cash. That attitude will come through in your music — it will be boring and matter-of-fact. If you do love it, then don’t let anything get you down. Practice carefully, find solutions to your problems, and keep your goals high. Never settle for “good enough” when you’re practicing, but when it’s time to hit the stage, forget about all your “ideas.” Do what you have to do to keep from getting completely out of control, but always remember that you can make a lot of mistakes without anyone noticing or caring. Don’t show the audience what you’ve practiced, just allow the music to convey your feelings. 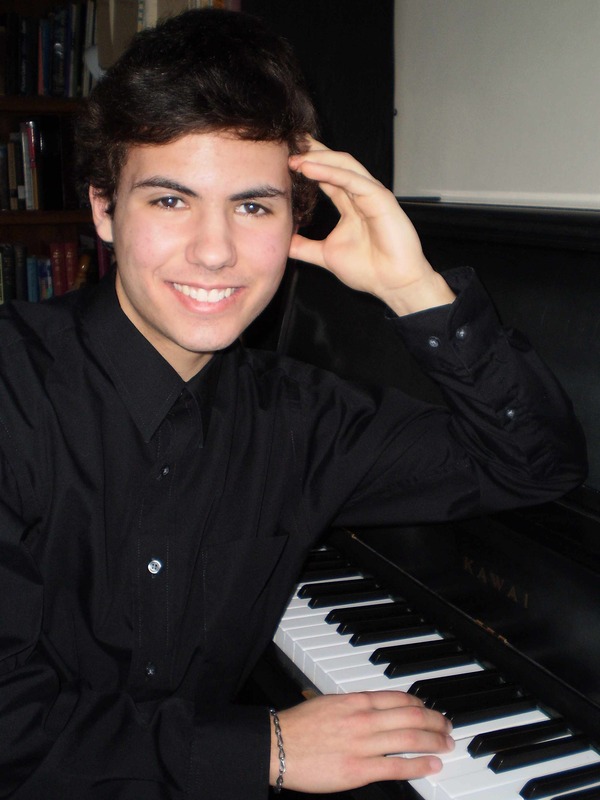 Classical music interview: Teenage pianist Joseph Hauer discusses his life, the music of Beethoven he will perform at the first free Concert on the Square this Wednesday. Part 1 of 2. But the opening concert this week will feature classical works. And the featured soloist is a student – Joseph Hauer, an Appleton, Wis., resident who won the Wisconsin Chamber Orchestra’s Young Artists Concerto Competition. He will perform the first movement of Beethoven’s Piano Concerto No. 3 in C Minor, Op. 37 (1803), the same piece Hauer played to win to the competition. Given all the interest in classical music and its place in the lives of young people, Hauer (below) recently agreed to an e-mail Q&A with The Well-Tempered Ear. It will run in two parts, today and Tuesday. Can you tell us some things about yourself? I’m a kid. I love playing baseball and football, but I’m not big enough to do it “for real.” I’m a big Packers and Brewers fan, and I follow the Bucks once they get into the playoffs. I’m very competitive, but I’ve tried to phase that out of my music life — pretty successfully. At what age did you start taking piano lessons and how old are you know? I am 17 years old and I began taking piano lessons when I was 6. However, my mother got me started on piano and gave me lessons until I began studying with a private teacher. When I was looking through my old primer books, I found dates on songs I played going all the way back to when I was 3 or 4. I currently study with Professor Catherine Kautsky at Lawrence University in Appleton. Was there a particular piece or moment when you knew you wanted to play the piano really well? Definitely! 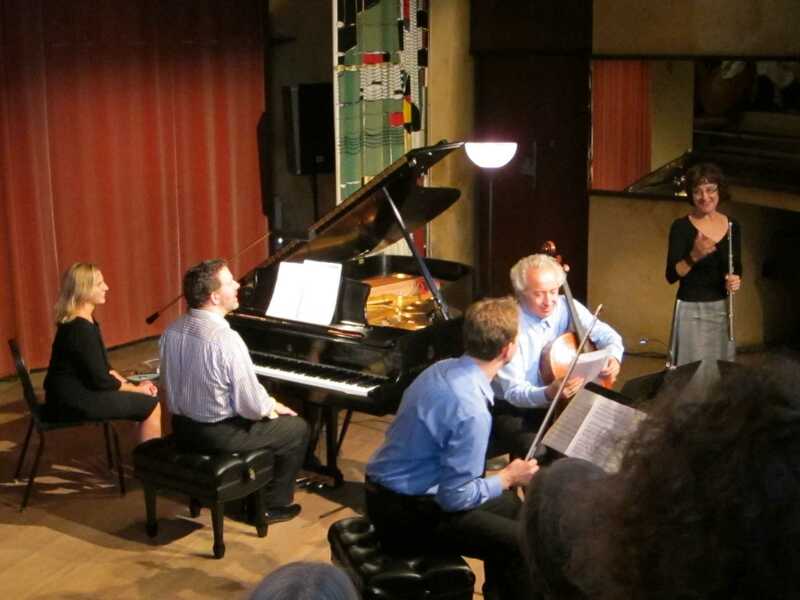 I went to the Golandsky Institute Summer Symposium at Princeton University in 2008 to learn the Taubman Techniques for piano. The technique had me playing more freely within the first couple of days and I’ve continued to study and implement the technique so that my playing will eventually be completely effortless. 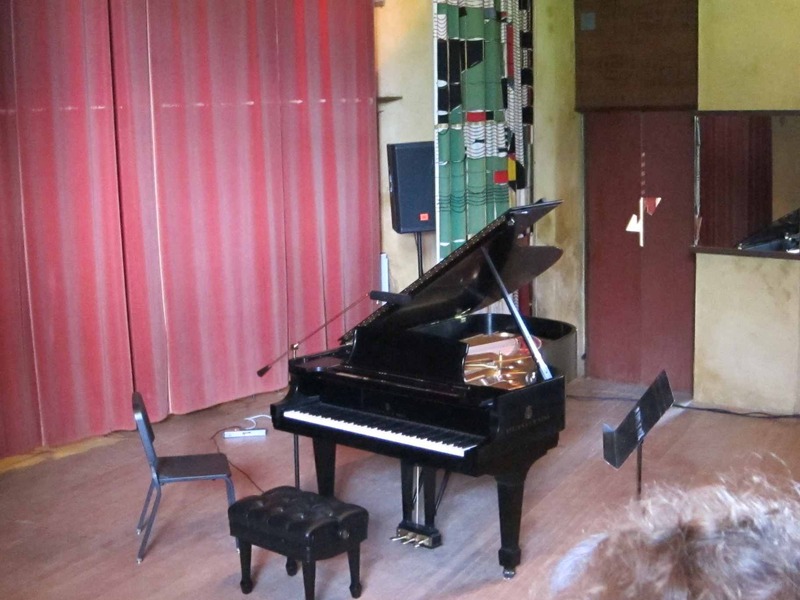 At the Symposium, there was an International Piano Festival. I heard one of the Golandsky Institute teachers — Ilya Itin — perform a solo recital and I was struck, not just by the power of his music, but by how playing was effortless for him. I decided that if I could perfect the Taubman Techniques, I would be able to perform at such a high level — musically and technically — that a career in piano performance was a definite possibility for me. There was still that “if,” though. I hadn’t decided to make music my life and career. The winter following that camp, I competed in a high-school concerto competition and heard a pianist perform in the final round who eliminated my “if.” His performance demonstrated to me that even at the high school level, a performer can emotionally affect an audience. His playing affected me so much that I decided I could and would go into a career in music (if he can play like that, I can too). Do you play other instruments? Is your family musical? I also play violin (I played the first movement of Tchaikovsky’s Violin Concerto at my senior recital). My family is very musical — my older sister just graduated from Lawrence with a double degree in piano and violin performance, my older brother will be a Junior at Oberlin Conservatory majoring in Violin Performance, and my little sister is taking both violin and piano lessons. My oldest brother doesn’t play very much any more, but he took piano lessons through high school. How much do you practice each day? I generally practice 2-3 hours each day. If I have a performance or competition approaching, my practicing might increase to 3-4 hours a day, with a few 5-6 hour days here and there. I also practice about 1 hour of violin a day during the school year. What are your plans for college and then a career? 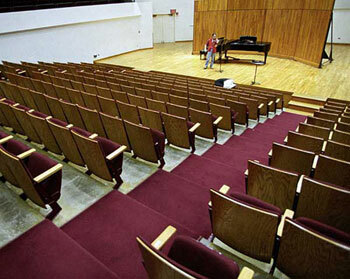 I will attend the Oberlin Conservatory this fall for piano performance. I’ll be in the studio of Peter Takács. I want to make a career of performing for the simple reason that I love to play for people. I don’t play piano to impress people with bigger, faster, louder. Technique, musicality, phrasing, and all the elements that go into music are just a means to an end for me. Perfection, too, is just a step along the way, and I’ve found it is not an absolutely necessary step. My goal, of each and every performance, is to convey my emotions to the audience. I don’t try to make an “original interpretation” of any piece, I try to let the piece play itself. Each piece of music has the potential of calling up specific emotions in the performer and conveying them to the audience; my goal is to allow the process to take place naturally. That is where the magic of music lies: two people can perform the same piece, both performances can be effective, and yet the performances are completely different. That is because the performers are different people, they have lived different lives and experienced different emotions. Music is “alive” when the performer lays out his whole life on the stage and lets it come through the music. Forcing a particular interpretation or imitating a different person’s performance makes the music dry and boring. 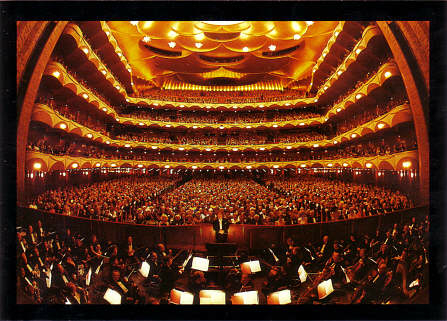 Care to guess what is the world’s largest performing arts organization? 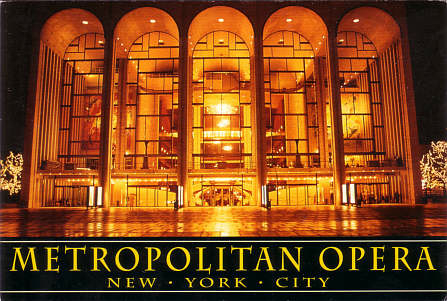 It is the Metropolitan Opera (below with exterior on top and interior on bottom) in New York City, which I didn’t know. But I — and just about everyone lese — knows that opera is the most expensive form of performing arts to stage. Grand opera is truly grand in every way. So it’s only natural to wonder how the iconic Met has fared during the past two years of severe economic downturn. I was particularly interested to read about the success the Met is having with the live hi-def broadcasts, which it will expand this coming seas0n — even as they broadcast will air at two locations in Madison (Point Cinemas on the west side and Eastgate on the east side). 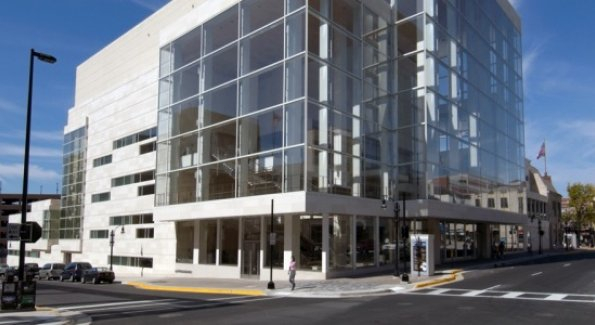 The story also makes you realize you luck we are in Madison, now that it seem a deal has been struck to eliminate a large chunk of the debt that has plagued the Overture Center (below). Have your donations to the arts gone down during the recession? What do you think of the Overture debt deal? 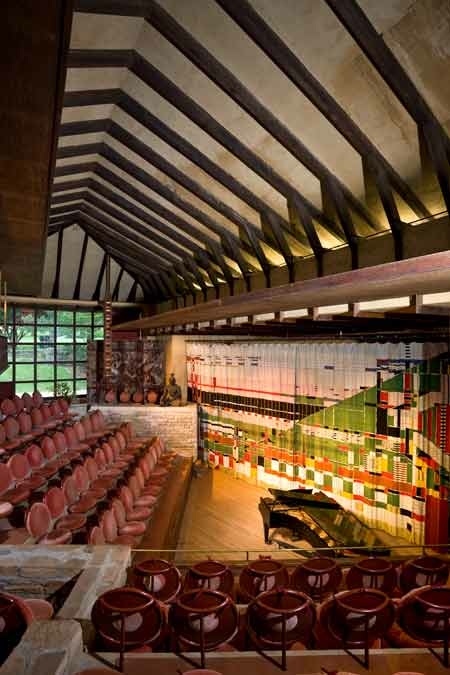 So there I was — all these photos are mine from being on the spot — attending a concert last Sunday evening by the Madison-based Bach Dancing and Dynamite Society in the historic Hillside Theater at famed architect Frank Lloyd Wright’s Taliesin compound in Spring Green, Wisconsin. 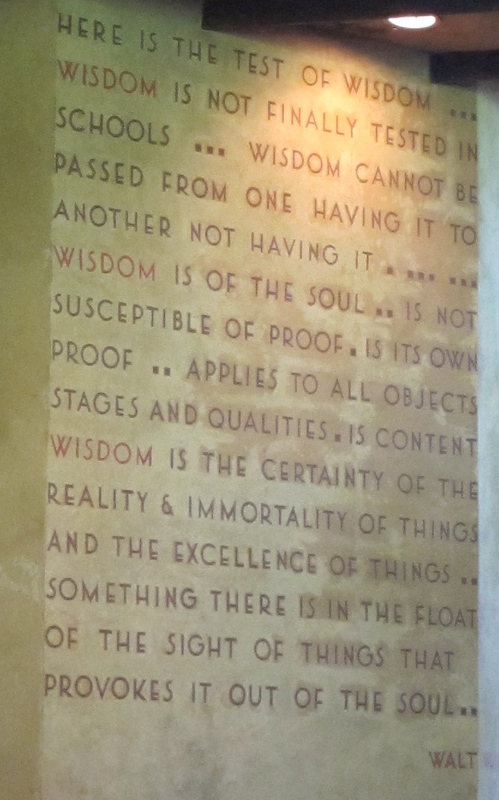 Wright was given to decorating his walls with words (in that clear architect’s block-print lettering) and other calligraphic or visual ornaments. 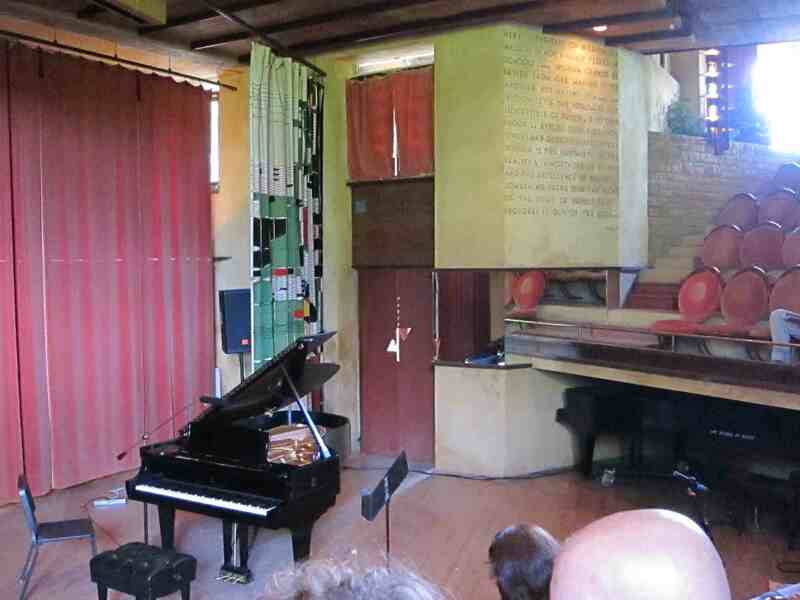 So right above a stage door (behind the foot of the piano in the photo below top), the audience could see notes painted brown on brown from a musical score (below bottom). Right around the corner of the wall was an extended quote about wisdom by Walt Whitman, a favorite poet of Wright. But, since it was not credited, no one seemed to know for sure what piece of music the excerpt came from. I thought I knew the answer and said so to my concert companion. But I wanted to be sure. So I took a picture, then waited until I came home to blow up the picture, print it out and play it on my piano. And voila — I found out my first impression was right. 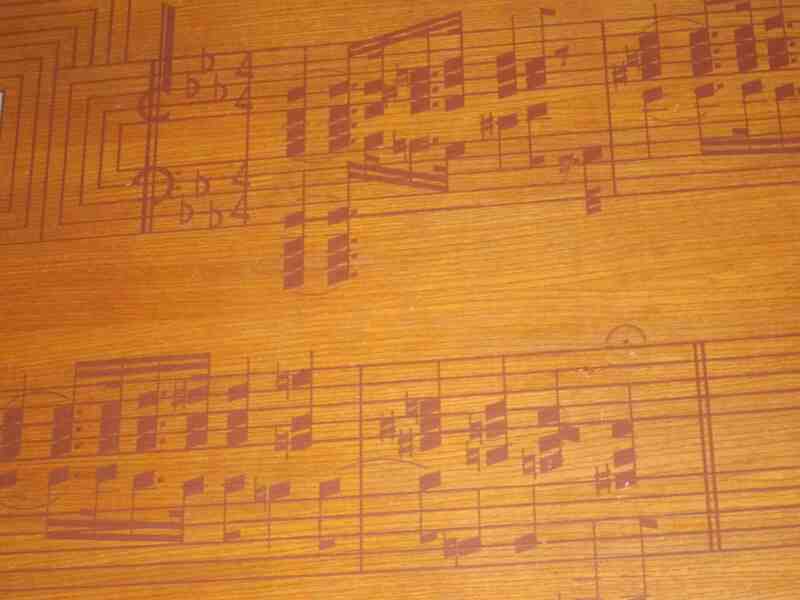 My first thought, seeing the inscription, had been: It must either be a piano work or a piano reduction of a score for some other instruments or orchestra. Knowing Wright’s like of authenticity, I figured the first was much more likely. Then I saw the signature and the key marking with B, E and A flats. And I saw the big chords at the beginning. I also knew that Wright was especially fond of Beethoven. So at first my educated guess what that it came from Beethoven’s famous “Pathetique” Piano Sonata in C Minor, Op. 13. It is one of Beethoven’s earliest “Romantic” works. And it seems a fitting choice for Wright, both in its pathos and its drama as well as its sublime beauty. One could also add that it seems apt for Wright, given its status as a transition between Classical and Romanticism in music, much as Wright’s buildings are a modernist keystone or bridge between older traditional architecture and more contemporary styles of building. And when I played it, I found my initial hunch was right. But it is not the familiar opening of the sonata. Coming before the development section, it is a bridge, a recapitulation of the famous opening with its loud, dark, big minor chords and dotted rhythms. So there it is: Mystery solved. Now The Notes on the Taliesin Wall can enter the archives at the landmark arts compound. And tour guides can tell visitors what it is. Maybe they can even find a passage in Wright’s work about that particular piano sonata of Beethoven and what “Mr. Wright” liked about it. The “Pathetique” might also be a good choice, then, for UW pianist Christopher Taylor to perform during an upcoming benefit at Taliesin. It would be both popular and appropriate. Do any of you know more about Wright and Beethoven or his taste for classical music in general? 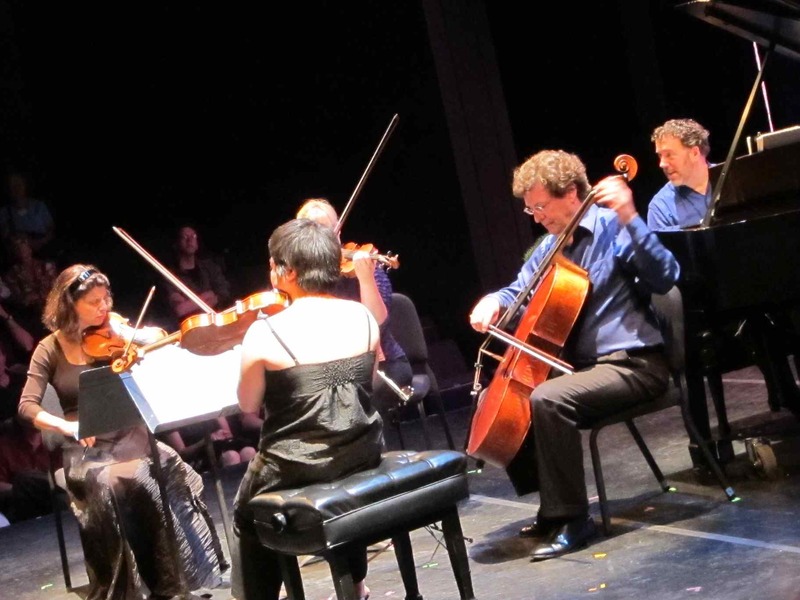 Classical music interview: Wisconsin Chamber Orchestra music director and conductor Andrew Sewell talks about the role of classical music in the popular Concerts on the Square. Part 2 of 2. Next Wednesday night, June 30, at 7 p.m., the Wisconsin Chamber Orchestra, under the baton of music director Andrew Sewell (below) – who next season will mark his 10th season of with the WCO — will kick off its 27th annual series of Concerts on the Square up around the state Capitol. I recently asked Sewell about the role of classical music in Concerts on the Square, which have become a summer institution and can attract up to 20,000 people to the stat Capitol grounds and area. How has the audience’s attentiveness to classical music versus other kinds of music during COS changed over the years? When I first arrived, I inherited a tradition of fast and loud, with lots of Sousa! We still maintain some Sousa for encores, and traditional concerts, such as July 4th, but I believe that if music is played well, and with integrity, it will tell its own story to an audience and captivate them. We’ve also improved the sound quality, and sound monitoring and had more concerts broadcast over Wisconsin Public Television. Also, there has been a marked difference in how quiet it is at the beginning and during concerts, which shows better attentiveness. What reactions do you get when you program classical music that, unless it is the 1812 Overture, is not expected? Each concert has a theme and title. I like to include some unfamiliar works as well and, along with Norman Gilliland, try to share insights and stories to each piece by way of spoken introductions. The 1812 has become such a tradition for July 4th, and with the special cannons from Illumination International to accompany the end, many people flock just to hear them go off! During the July 4th patriotic concert, we also recognize the veterans present in the audience for their service, and perform the Armed Forces Salute, This work includes the theme song of each branch of the military in which they served. What are your future plans about programming classical music for Concerts on the Square? I think the mission of any orchestra is to perform and introduce classical music at the highest level. I like to find new and unusual pieces that people may not have heard, and share it with them at Concerts on the Square. I’m also searching for new repertoire and programming options. Often I’ll come up with odd pieces that I think would work well for a Concert on the Square audience or introduce a guest artist that may be unusual for example, the Harmonica virtuoso Robert Bonfiglio or singer Hayley Westenra. We like to celebrate our own as well, and last summer performed the entire Rachmaninov “Paganini” Variations with Madison native, and now Philadelphia-based pianist, Christina Naughton. I think the pendulum swings between a more classical oriented COS season, and a popular one. Sometimes the popular concerts are 1 and 2, 5 and 6. On other occasions I’ve programmed the first and last programs as all-out classical programs with more pops style concerts in the third and fourth programs. That’s how it has fallen this year. We have two popular concerts – “Poperazzi,” with guest conductor Michael Krajewski, and the Beatles Tribute band, “Yesterday,” performing on the COS concerts 3 and 4, respectively. 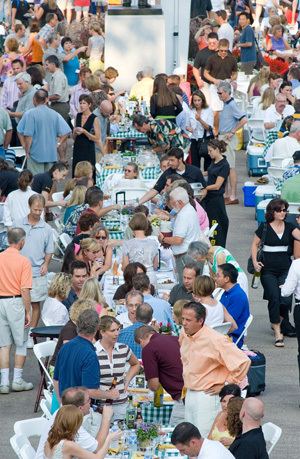 What comments of praise or criticism would you like to leave about Concerts on the Square? Classical music interview: Wisconsin Chamber Orchestra music director and conductor Andrew Sewell talks about the role of classical music in the popular Concerts on the Square. Part 1 of 2. 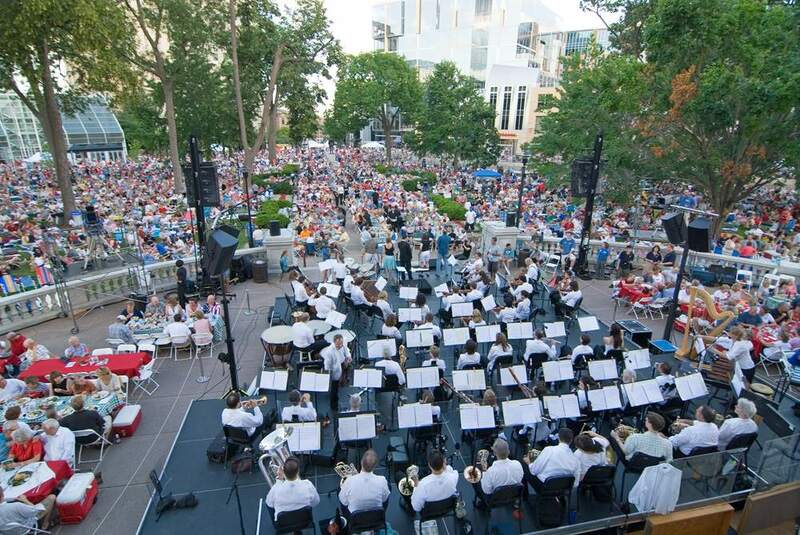 Next Wednesday night, June 30, at 7 p.m., the Wisconsin Chamber Orchestra, under the baton of music director Andrew Sewell – who next season will mark his 10th season of with the WCO — will kick off its 27th annual series of Concerts on the Square (below) downtown around the state Capitol. What are Concerts on the Square (COS) all about? But the opening concert next week will feature classical works. And the featured soloist is a high school student – Joseph Hauer, an Appleton, Wis., resident who won the Wisconsin Chamber Orchestra’s Young Artists Concerto Competition. He will perform the first movement of Beethoven’s Piano Concerto No. 3 in C Minor, Op. 37 (1803), the same piece Hauer played to win to the competition. I recently asked Sewell (below) about the role of classical music in Concerts on the Square, which have become a summer institution and can attract up to 20,000 people to the stat Capitol grounds and area. Here is his e-mail Q&A with The Well-Tempered Ear. It will run in two parts, today and Friday. How does the amount of classical music you’ve programmed for the pops format of Concerts on the Square changed over the years? Stayed the same? Lessened? What is your philosophy of programming classical music for COS? To be honest, I’ve never considered it a “pops format.” When I arrived here, I realized it was more akin to the Neighborhood/Runout concert concept that I had been used to programming while I was the resident conductor of the Toledo Symphony. I try to include standard orchestral repertoire, as well as more popular classic choices. This is a program format that has wide appeal to a general audience, who might come to a concert once a year. Putting this into a context of a six-week series, I can program whole concerts of one genre or another, as well as intermingle them. Over the years, we’ve found a mixture of thematic programming and general programs seem to work. We always have a patriotic themed program around the second concert, as it falls during July 4th celebrations. We have a Young Artist competition winner to perform at one of the concerts. I also program at least two or three concerts as purely classical, “masterworks” style programs, and others more in a pops style, with guest artists taking the lead — for example, the Sonnenshein Express from Florida, or pianist Robert Wells, or harmonica virtuoso Robert Bonfiglio. I’ve also asked some classical soloists to play two signature pieces of shorter length rather than one 30-minute long concerto. This format seems to work well, since it allows time in between pieces with a 12–14 minute piece being the maximum. A classic example is Gershwin’s “Rhapsody in Blue” that comes in at 16 minutes – perfect. Over the years, the audience has become quieter, and I have been able to mix works of lesser and greater sophistication. 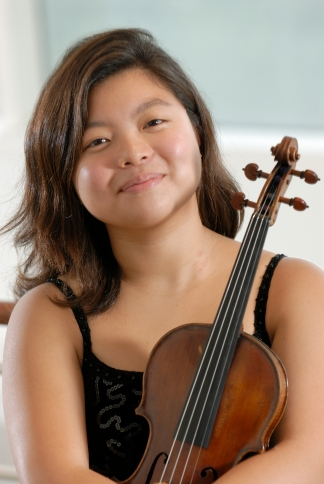 Since we expanded our Young Artist Competition to be statewide six years ago, the winner now appears on one of the Concerts on the Square, usually the first or second one. Does programming classical music for the COS concerts help WCO build audiences for the Masterworks series during the regular concert season? No, there is no correlation between the two. Theses are separate products the WCO offers. The Concerts on the Square, is one product. Masterworks concerts are another. Research has proven it to be the case, and it is the same with Pops audiences switching over to Classical programs in other markets. People either like it or they don’t. But I certainly believe it builds awareness and serves the community to have free concerts open to the public. What do you look for in a classical piece when you program it for the COS? Do you look for a typical tone, length or sound? Yes, I do consider the length, tone and style of a piece. Generally, I think in terms of programs and what pieces may fit. Instrumentation can be a factor and tempo also. For example, for some time, I’ve wanted to include the Adagietto slow movement from Mahler’s Fifth Symphony (a work for strings and harp alone that was used a the soundtrack for Visconti’s film “Death in Venice”) into a program, and this year it seemed right to be able to do that on a program that celebrates Vienna, along with the music of Johann Strauss. Now it’s slow and soft, but absolutely spell-binding, and having it placed near the beginning of the concert (after the overture) will keep the audience’s attention. We’ll see. I like to include well-known pieces, or warhorses, that an audience never tires of — for example, Beethoven’s Fifth Symphony or a Mozart overture or a symphony by Dvorak, Tchaikovsky or Brahms. They’re all familiar to a general audience. 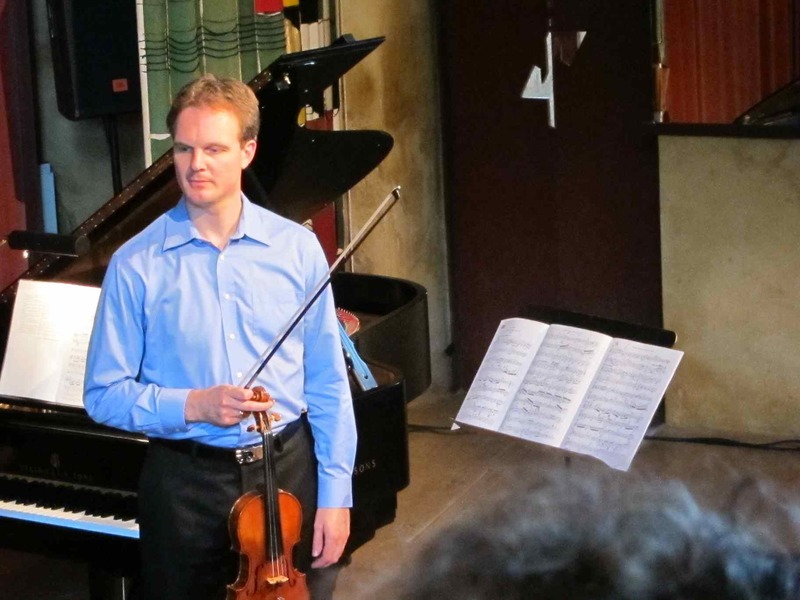 Tomorrow: Andrew Sewell on the audience’s attention span and attentiveness to classical music; and whether exposing pops audiences to classical music gets them to attend classical concerts. It’s Wednesday — the day of the week when The Ear picks his Best Bets for the coming week. But when it comes to classical music, there isn’t much choice this week. I haven’t heard all the programs that the Bach Dancing and Dynamite Society has put on this summer for its 19th season. But of the two concerts I have heard, I would have to nit-pick to find a flaw. So I will gladly recommend the four remaining concerts of the two remaining programs. As for performers, it is a bit like tag-team music-making. This week’s team switches from the San Francisco-based guest players of last week to local players — cellist Parry Karp and violinist Suzanne Beia of the UW Pro Arte String Quartet — as well as imported harpist Heidi Krutzen of Vancouver (below top), freelance violist Yura Lee (below middle) and Brooklyn, N.Y., violinist Carmit Zori (below bottom). 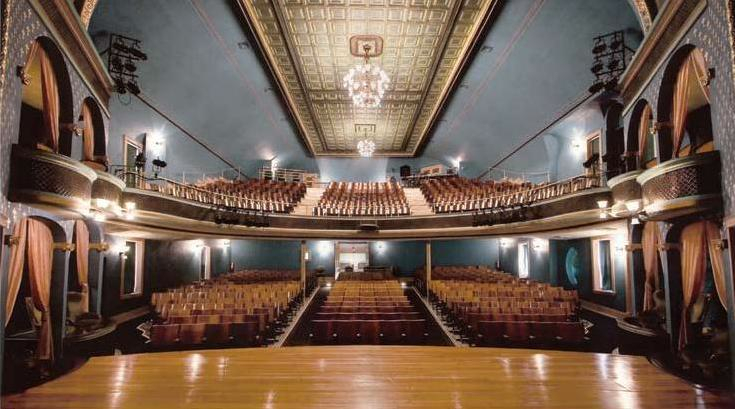 On Friday and Sunday — first at the Stoughton Opera House (below top) at 7:30, then at Frank Lloyd Wright’s Taliesin Hillside Theater in Spring Green (below bottom) at 2:30 p.m. — the BDDS will perform “A Tale of Two Cities” program, playing off Charles Dickens’ famous novel of the French Revolution and the roles of Paris and London. The Ear finds this program particularly noteworthy for its attention to less well-known British composers who deserve a wider hearing. On Saturday and Sunday — first at the Overture Center Playhouse at 7:30 p.m., then at the same Hillside Theater at 6:30 p.m. — the BDDS will perform the “East of Eden” program. It doesn’t really seem to relate much to the novel of the same name by John Steinbeck, but I nonetheless find noteworthy for its mix of modern and contemporary music. This year’s Birthday Boys — Chopin, Schumann and Samuel Barber — will also be featured in the concerts. With all respect to Dickens, we hope that you find this evening — with great music from two of the glittering capitals of Europe, Paris and London — the best of times rather than the worst. 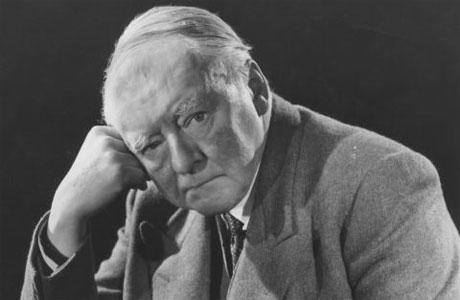 From north of the Channel we have Elegiac Trio for flute, viola, and harp by Arnold Bax (below), a gorgeous work full of mists, fogs, and more than a little French spirit. Frank Bridge’s Phantasy Piano Quartet epitomizes both the somber and the witty sides of British life. From sunny Paris, we have Debussy’s famous Prelude to “The Afternoon of a Faun” in an arrangement for flute and harp. Chopin’s Sonata for cello and piano, his last published work, is a thrilling piece full of passion and sweep. We conclude with the Suite for two violins and piano of Moritz Moszkowski, a work that’s so exciting, it will send your head spinning. Inside its walls, the Garden of Eden was a paradise of perfection and plenty where all was clear and beautiful. The art of chamber music dwelled in a metaphoric Eden for a long, long time. Composers like Bach, Beethoven, Chopin, and Debussy used the language of Western harmony and rhythm — the language of our musical Eden — to create masterpiece after masterpiece. Some of these composers looked to the East for inspiration. They found musical elements that helped them craft modern masterpieces, masterpieces from beyond the gates of tonality. We begin our journey beyond the gates of Eden with Samuel Barber’s Canzone for flute and piano, a work of rare beauty that achieves a Zen-like timelessness. Albert Roussel drew from the music of India in his compelling Serenade for flute, harp, violin, viola, and cello. 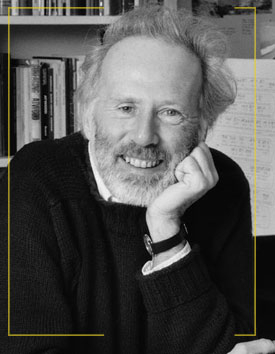 And Canadian composer R. Murray Schafer (below) took inspiration from Greek myth for Theseus, a thrilling work for harp and string quartet. 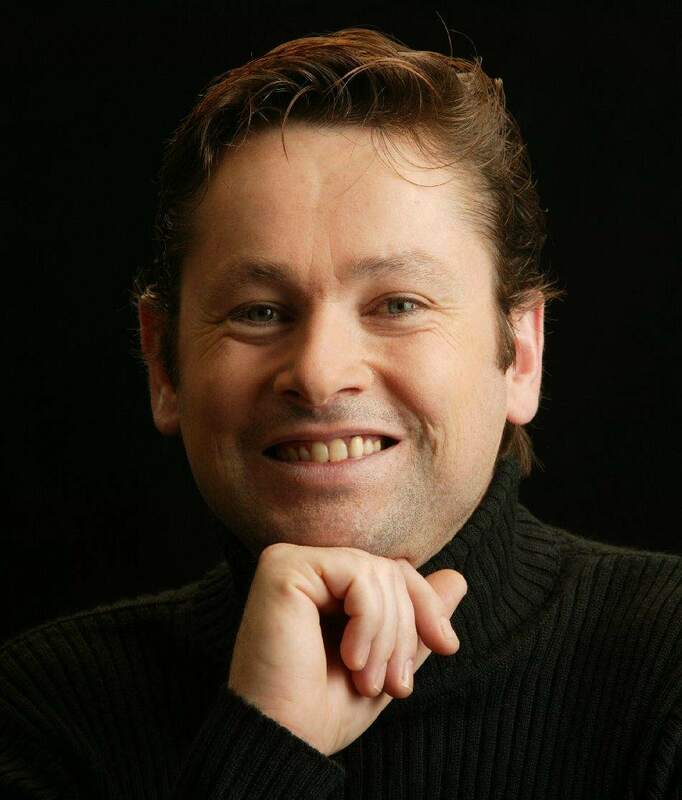 In Taheke, Australian composer Gareth Farr (below), a virtuoso tour de force for flute and harp, was inspired by the sounds of waterfalls in New Zealand. Our season concludes with a return to Eden: Schumann’s great Piano Quintet in E-flat Major, likely the most perfect work of its kind ever written, a work that was taken as the ideal for every composer of piano quintets that followed. OK — it’s back to The Ear. Now that the Bach Dancing and Dynamite Society is about to finish this summer’s season, what would you like to tell them about its performances? About its schedule and venues? 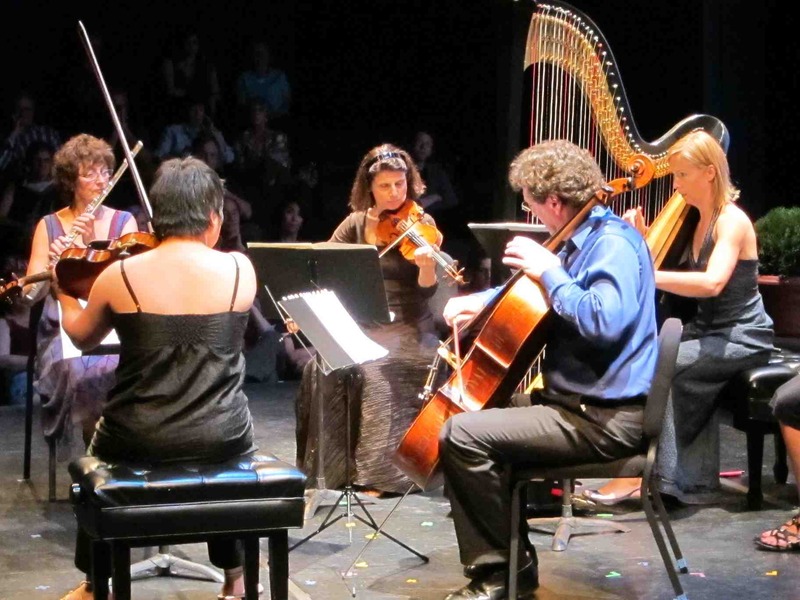 Classical music review: Bach Dancing and Dynamite Society changes the musicians but keeps the quaIity — and proves again it is a chamber music group for all seasons. There are many things to like and to admire about the Bach Dancing and Dynamite Society, now that is two-thirds of the way through the three weekends of performances that make up its annual summer season. I find it amazing, for example, that pianist and BDDS co-director Jeffrey Sykes plays so much different music and so much difficult music – both established classics and contemporary works — all with confidence and conviction as well as subtlety and good humor. But another big source of admiration has to be the reliable consistency that BDDS manages to keep despite using different performers. On Sunday night, for example, I heard “The Sound and the Fury” concert – the theme of this summer’s concerts is “Novel Obsessions” – at the Hillside Theater at Frank Lloyd Wright’s Taliesin complex in Spring Green. I will deal with the mixed reactions I had to the historic and architecturally iconic concert hall itself (below) in another post. Suffice it to say the acoustics were fine and the performers seemed comfortable on the stage and in the setting that seems to encourage intimacy. You might think that the historic setting would be the star of the show. But it wasn’t. That they played with terrific virtuosity and technical fluency was easy to perceive throughout the demanding program. 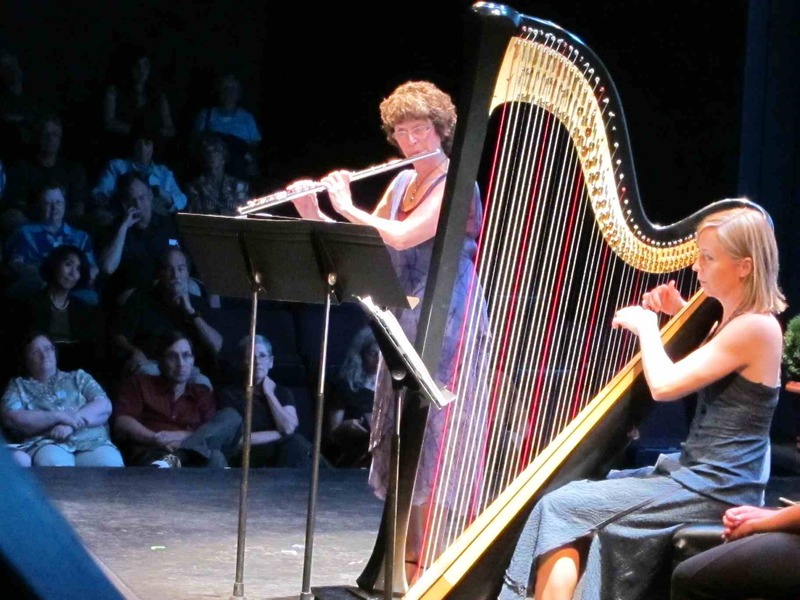 But the careful listener, the discerning ear, was more impressed by the rich tone the two men brought to their parts in a wide variety of music; by their unerring musicianship; and by their ability to blend, to dialogue with each other and with other players, including Sykes and flutist/co-director Stephanie Jutt. Violinist Strauss (below) kicked things off with a passionate and playful reading of Robert Schumann’s Sonata for Violin and Piano in A Minor, Op. 105. It is a terrific, work, by turns dramatic and lyrical, that comes from the late period that in Schumann’s case is often underestimated because of his mental illness. That received wisdom simply has it wrong. But it was the last three works — by turns French, German and Latin American for contrast — that spotlighted the gifts of two imported guest artists as well as on the Sykes-Jutt team. The key to Gabriel Faure’s late Piano Trio in D minor, Op. 120, is refinement, and, helped by Sykes, Strauss and Fonteneau (below) captured perfectly the special idiom that Faure developed. The three men ended up proving once again that the exquisite Faure – the slow movement simply broke your heart — is right at the top of the list of under-performed, under-appreciated composers. 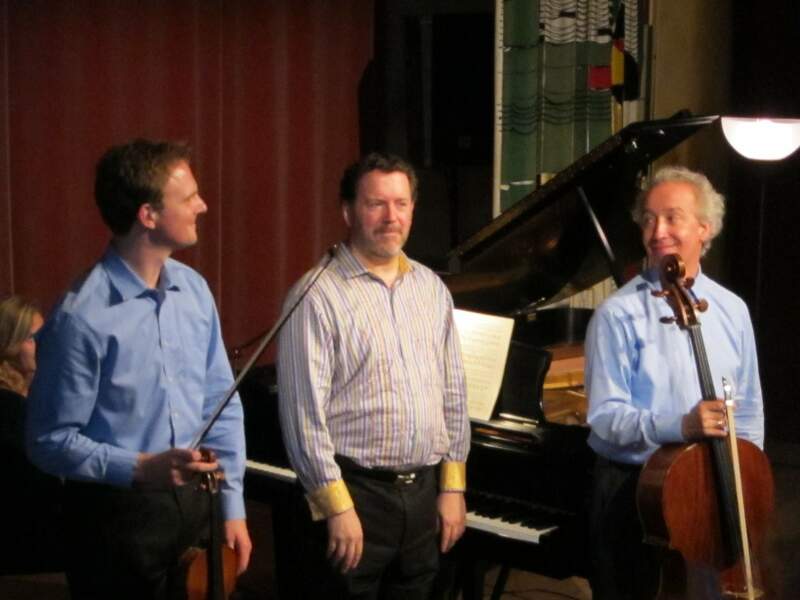 In Brahms’ last Piano Trio in C Minor, Op., 101, the two string players easily handled the sheer heft and orchestral coloration of the classic work. It is a compilation of those wonderful “new tangos” that was by turns poignant and introspective and then suddenly exuberant. And once again, the two guests artists matched every mood, every twist and turn, of the music. And they topped it off with virtuosic ensemble playing that brought a closely attentive and particularly quiet audience to its feet for a prolonged standing ovation. One could say much more about each piece, each composer and each performer. But in the end the most impressive aspect was the sheer consistency of the music-making, despite the hectic schedule the BDDS keeps up for its three-week season. As the Piazzolla and the other works so aptly demonstrated once again, BDDS is truly a chamber music group for all seasons. 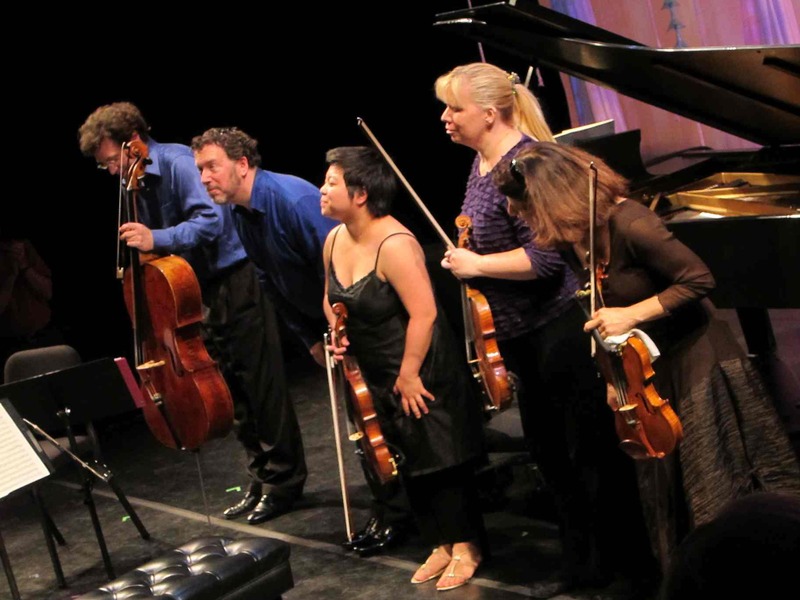 Have you heard the Bach Dancing and Dynamite Society so far this summer? 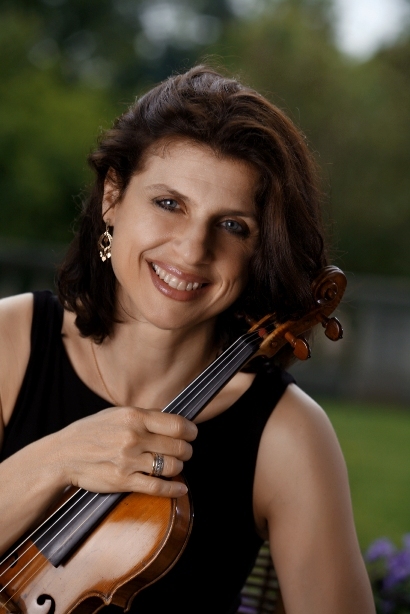 Madison has such a wealth of classical music all year long. And so much of it is free to the public. 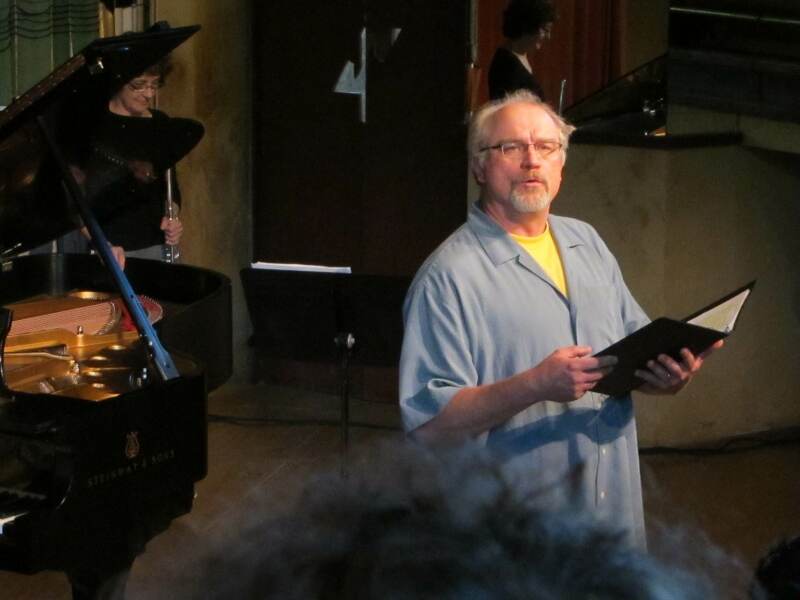 Last week, I posted the news that UW Faculty Concert Series, always a great series of performances, will be free for a second year. And now comes news that the exceptional line-up of Guest Artists — some of whom are alumni and some of whom will appear with faculty members – – will, as usual, also be free. So get out your datebooks and calendars. Here are the performers and dates, though programs are not yet available. 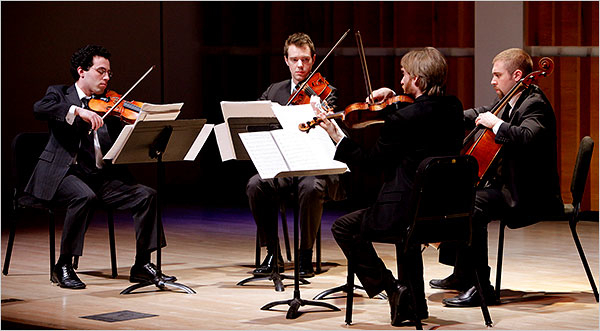 Wednesday, Nov. 10 at 7:30 p.m.: Jack Quartet (below) — Christopher Otto and Ari Streisfeld, violin; John Pickford Richards, viola; and Kevin McFarland, cello. 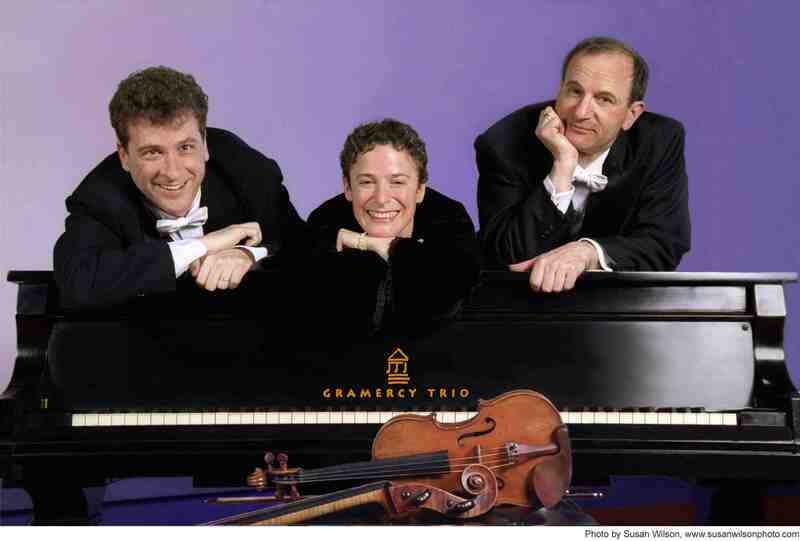 Wednesday, Nov. 17 at 7:30 p.m.: Gramercy Trio (below) — Sharan Leventhal, violin; Jonathan Miller, cello; Randall Hodgkinson, piano. The list of performers seems temptingly and satisfyingly eclectic to me, full of possibilities for listeners to stretch their taste and be experimental. Do you attend the Guests Artists Series? What do you think of the performers and programs? Do have advice about choosing which ones to go to?